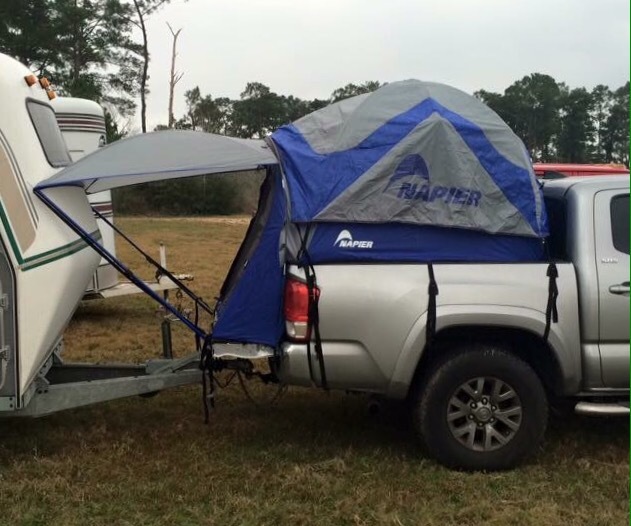 Remember when I mentioned a couple weeks ago that I was coveting a tent for my new truck? Guess what SO surprised me with last weekend? Of all the things I ever thought I’d get ridiculously excited over, a tent isn’t really one of them, but I love this thing. Mostly because I’m both cheap and poor, so any alternative to paying for a hotel room at horse shows is welcome. 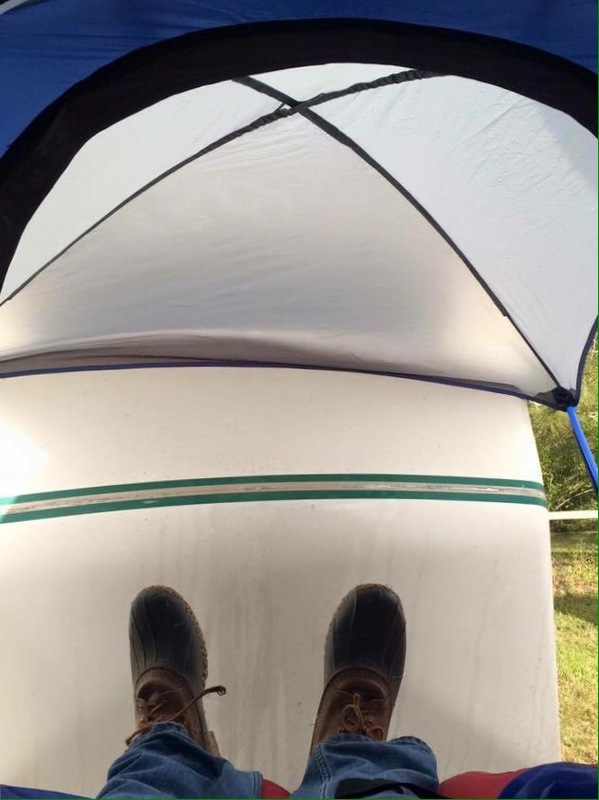 I have a 6.5 foot truck bed, and the tent goes all the way to the end of the tailgate, making it about 8′ long total. Plenty of sleeping space. It’s about 5′ tall on the inside, so while I can’t stand all the way up, I can stand up well enough to get dressed. There are also cool storage compartments and a shelf inside of the tent for lights and stuff. It took a little bit of trial and error to figure out the best way to put it up, but it’s really pretty simple once I got it. It’ll be harder to do with one person of course, but do-able. It was SUPER easy to take down and fold back into it’s carrying bag. The SO also bought me the truck bed air mattress that blows up via a rechargeable battery pack that plugs into one end. It inflates/deflates on it’s own and is a regular queen size bed. Fancy. And mesmerizing to watch. I’m not sure when I’ll actually get the chance to use it for the first time… my spring show season is going to be pretty sparse since I’m saving up for Coconino. BUT – Bobby did get to use his this past weekend. Yes, he bought one too. Because he’s a copy cat in every way, shape, and form. Imitation is the most sincere form of flattery though right? Figures, he’s obsessed with me. His truck is smaller and his bed is shorter but with the tailgate down it still gave him enough sleeping room. He said it was awesome! We’re totally glamping now. I can’t wait to make a little tent city at shows. I wanted to do this set up but the boy over ruled me because we tend to put so much in the back the truck and he doesn’t want to do all that unloading…. but I think we end up doing all of that anyway! Maybe I can get him to rethink it. I usually have the bed packed with hay and shavings and my tack truck, but the tack truck and hay come out immediately and the shavings are easily transferred to the trailer for storage. Plus we will now have the trailer with us and can pack all that stuff there. I think we will have to revisit the subject. Of course right now I’m doing one day shows so might not be a priority. Yeah, the trailer can definitely do storage duty while the tent is occupying the truck bed! I want one!! I no longer show but having a tent in the bed of my truck would be a legit summer time activity. And the best part is less bugs since you are off the ground! 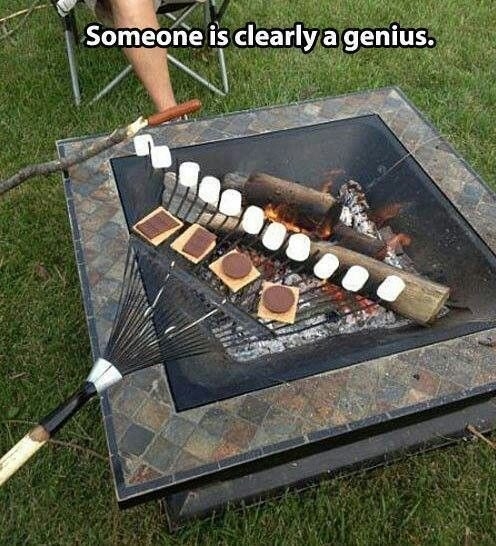 Plus you don’t require an actual camping space. If you can park there, you can sleep there. At horse shows that’s great since most of them don’t have camping spaces, just RV hookups. Very cool. Wish the weather here would cooperate with camping, but when I show (May-August) in Florida it’s just too HOT! I just ask others to take pity on my and allow me to crash on the couches in their trailers, lol. Ha, yeah we really don’t show in the summer since it’s so hot. It’s more of a spring/fall horse show season around here. Makes me feel extra lucky that I can show so close to home! I do not camp. Or glamp. Camping seems luxurious after some of the skeezy gross hotels I’ve had to stay in while showing in the middle of podunk nowhere. MCP, Corona, Pine Hill… options are pretty gross unless you want to drive a ways. Haha- sometimes I camp and immediately regret the decision. But I love the tent setup! I think all eventers do. Can you imagine the tent village parties? I’m with Tracy on this one, but that’s still super cool. I know a lot of my eventing friends tent camp at events in Arizona/Colorado/etc, although I think they just have boring old tents because of gooseneck hitches. The eventers always seem to be the ones that are much more into camping. Mine should pay for itself within two shows! I tried the bed cap idea and SO very strongly vetoed that one. But the tent is better for my lifestyle anyway, so I will admit he was right this time. Caps are still awesome though. honestly mine only has a cap bc it was already on when i bought the damn thing. i thought it was hideous and expected to pull it off immediately. that is, until i realized how useful it was for storage… so the cap stays and i rescind all previous derogatory comments made towards it lol. That kind of what I told him, that they’re SO useful. I just got glared at. I suggested this to Johnny, who looked at me like I was completely insane. I was like, “come on, we’ll save money! it will be fun!” and he was like “We own a regular tent, Stephanie. We can just use that. Or you can sleep in the horse’s stall. Or in the trailer. OR IN A HOTEL LIKE A SANE PERSON”. He’ll never be an eventer. Yeah, that’s definitely not the eventer spirit. Hotel schmotel. Although if you want to cure him of that sentiment take him to Corona HT and make him stay at the Baird Motor Inn. I got mine first so who is obsessed with who?? Exactly…. Score! Those tent rigs are awesome. When rain is expected, parking on a bit of an incline (front of truck) is helpful. We have a camper top for our truck. Like the hard sided ones that stay on all the time. It’s nice because we were able to ditch the inflatable bed for an actual (cheap from ikea) mattress and all of the stuff stays in it all the time. Our house is super tiny so storing camping supplies would be a huge pain. This is the perfect trainer’s gift so you don’t have to pay for their hotel room at shows. Also, please give Bobby my compliments. This is awesome!!! I must really live under a rock, cause I did not even know these things existed.